Note: You must be using one of our Supported eCommerce Platforms in order to add an inventory using this method. If you are not using one of our supported eCommerce platforms please see our Other eCommerce Platform guide. 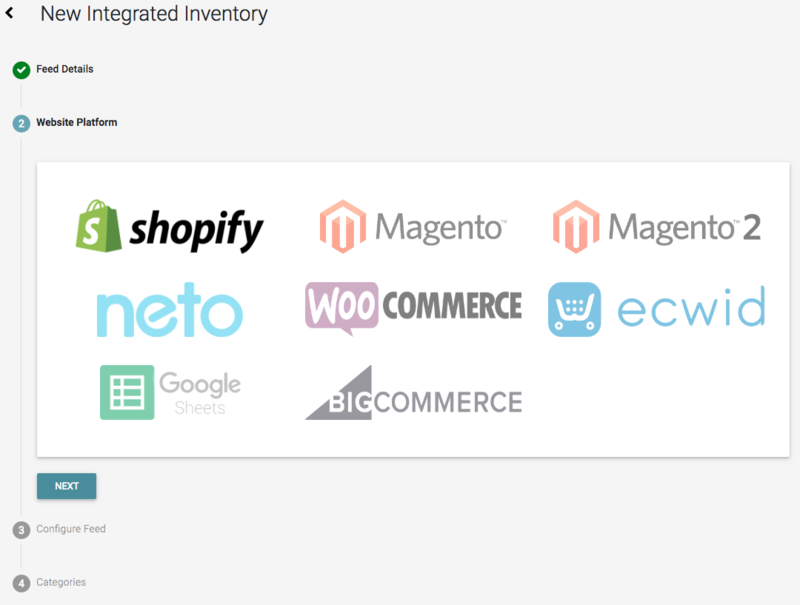 To create a new Website Inventory using one of our supported integrations, navigate to your website overview page, select the blue + icon from the bottom right corner of the page and click Integrated eCommerce Platform as shown in the image below. Enter a name for your inventory. 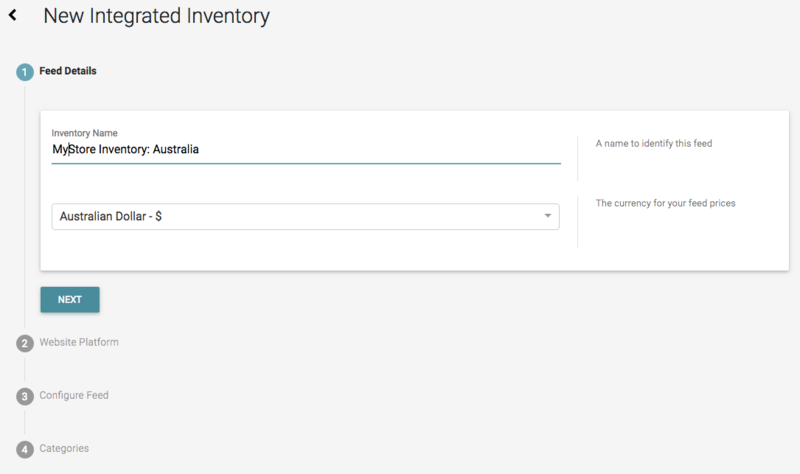 This name will be used to help you identify this inventory when creating your Advertising Feeds and Ad Builds later. Next, select the currency of the prices of the products which will be stored in your inventory. 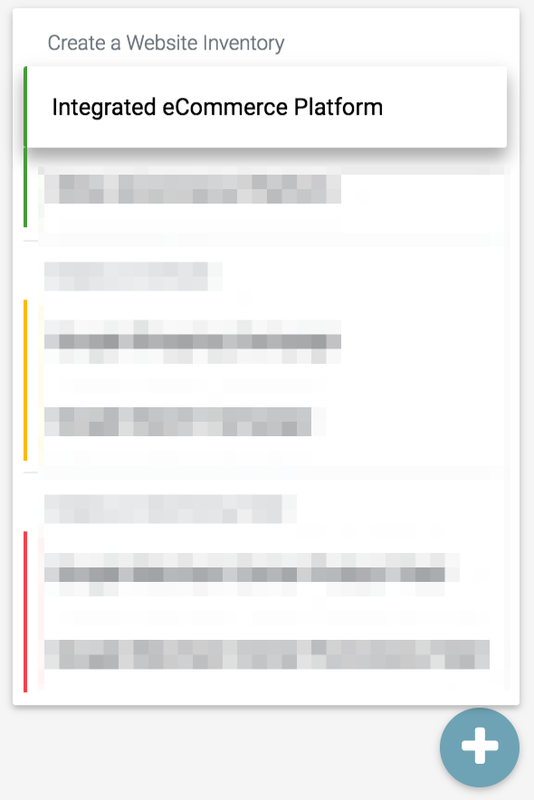 Select the supported platform you are using and click next (if your platform is not here you will need to use our Other eCommerce Platform guide). This step will guide you through the process of linking your supported platform to Ad Builder and subsequently downloading all of your website's product, category and promotional data into Ad Builder. Depending on your platform and the number of products, categories and promotions on your site, this process time can take up to 3-4 hours of processing time to complete. If you are not already signed in, you will need to sign in to our Feed Builder app using your Google account to continue. On this step you can set up replacements and variations for your inventories category, brand and category filter names to make the language used in keyword and ads more relevant to the way in which potential customers search for your products. For steps on how to configure your replacements and variations, see our Category Rewrites for Search Ads guide. When you are satisfied with your configuration, click the save button to save your inventory configuration and return to the Website Overview screen. You should now have a new inventory detail card added to your website overview. 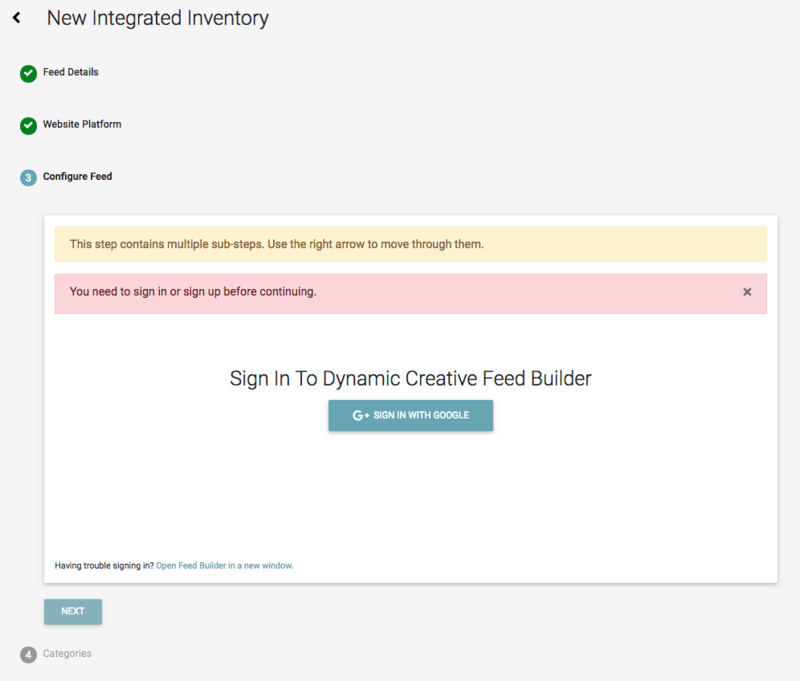 You can now create Ad Builds and Advertising Feeds from this inventory by clicking the + icon in the bottom right corner of the website overview screen.